I’m so looking forward to sharing this cake recipe with you. Firstly, because I want you to be able to make the most of the plum season. Secondly, because I want to be able to stop making this blooming cake 🙂 . This is my 9th attempt at this puppy and it’s great as the recipe has been thoroughly tested, but the trouble is, you see, that I enjoyed the ‘testing’ process a little bit too much. 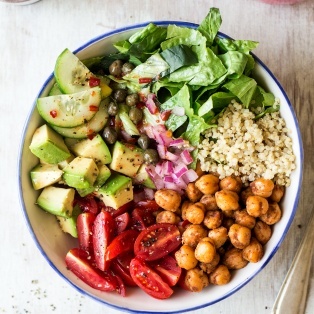 I tried to offload some to my yoga class guys, friends and neighbours but it hasn’t been easy as it’s August and no one wants to leave the house (the roads are insane – massive traffic jams and reckless driving in full swing) so, unfortunately, I’ve been ‘forced’ to eat a bit too much of it myself 😉 . 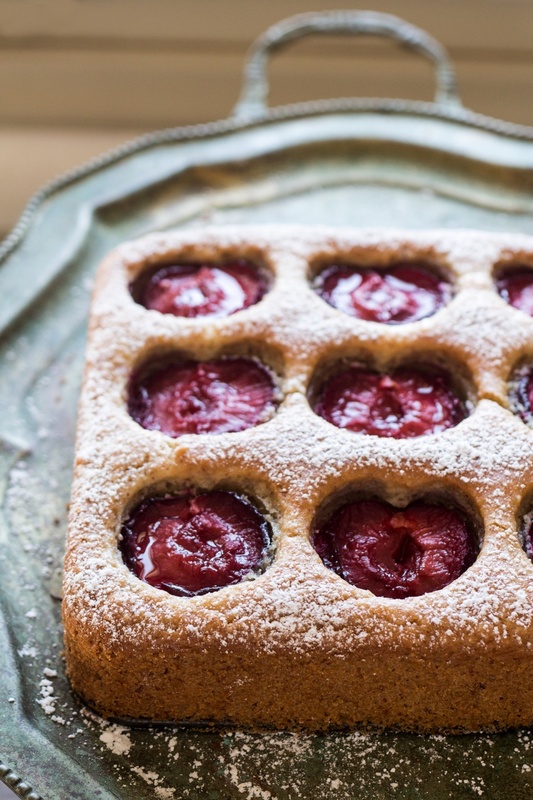 This recipe is based on a classic Polish (although most people know it as German, go figure) plum cake that my mum used to make when I was a child. It features a fluffy sponge base with pools of jammy plums on top and a light sprinkling of icing sugar to finish. Unfortunately, my mum’s cake was neither vegan (it contained 4 eggs!) nor gluten-free so to provide a vegan and gluten-free option for you guys, I’ve had to twist this recipe a fair bit. I decided to make the crumb a little lighter by swapping a portion of the flour for finely ground almonds. 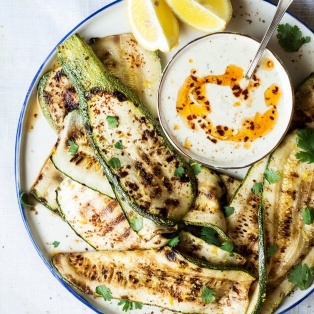 You don’t need to use almond meal for this though, although you can. I simply ground whole almonds until fine in my very average food processor and it did the job perfectly well. This cake is fluffy and rises beautifully thanks to the combustive reaction between lemon juice and baking soda. I was really happy with my 5th iteration and was ready to shoot photographs for the blog, but on my 6th attempt, I went a little bit too plum-happy and crammed so many plum chunks on top that, when the cake rose, there was no rhyme or reason to the pattern and it looked like I decorated it under the influence. I decided that it wasn’t good enough to be photographed. My 7th attempt was looking very promising, it rose beautifully in the oven and had a nicely browned top but then the unthinkable happened and one rebel plum sabotaged all my effort by sinking to the bottom of the cake causing it to crack a little (if you follow us on Instagram, you might have seen this rebellious plum on our Instagram Stories). PS: If you make my vegan German plum cake, don’t forget to tag me on Instagram as @lazycatkitchen and use the #lazycatkitchen hashtag. I love seeing your takes on my recipes! Heat up the oven to 170° C (or 150° C fan forced) / 340° F (300° F fan forced). Grease a baking tin with a very small amount of oil. Mix all the wet ingredients in a large bowl. Place a sieve over the bowl and sift through all the dry ingredients, except for the ground almonds. If you are using wheat flour, be careful not to overmix the batter as the cake will be tough. Fold in the finely ground almonds. Again, if you used regular wheat flour, take care to fold them in very gently or else the cake will be tough. Transfer the batter to a lightly greased baking tin. If your tin doesn’t have a removable bottom, it may be a good idea to place 2 long and wide strips of baking paper down first so that you can use them as handy tabs to make cake removal easier. 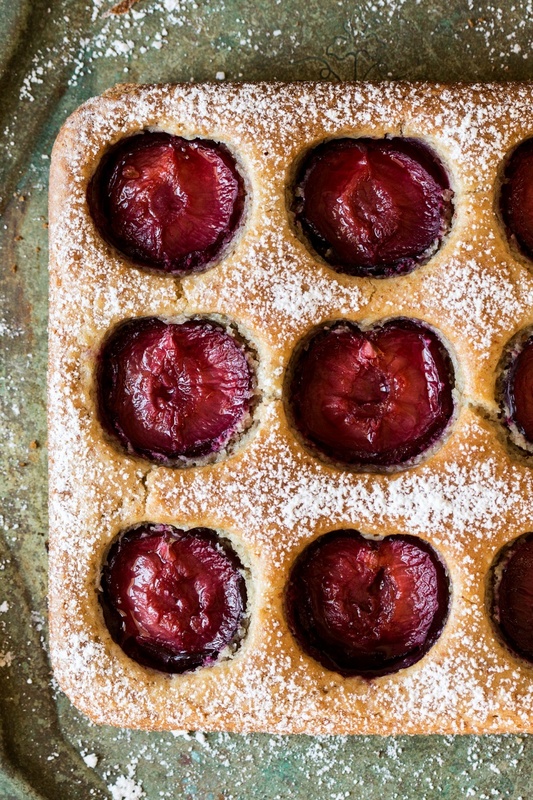 Decorate with plum segments or plum halves if your plums are little. 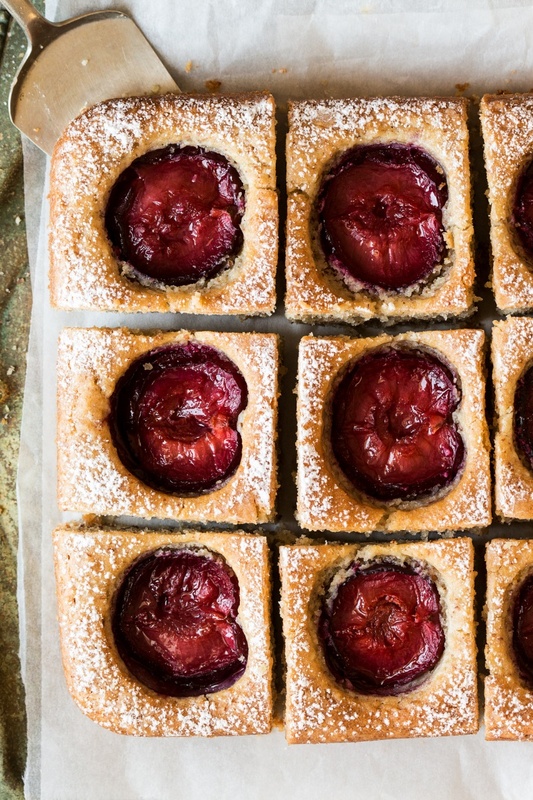 To prevent plums from sinking to the bottom, dip the side of the plum that will rest directly on the batter in a little bit of all purpose flour (or cornstarch for the GF version) first before arranging on top of the cake. Bake for about 55-60 minutes, until a toothpick comes out clean and the top is nicely browned. Once cool, remove from the tin, sprinkle the top of the cake with a little bit of icing sugar and perhaps a dusting of ground cinnamon too, if you like. 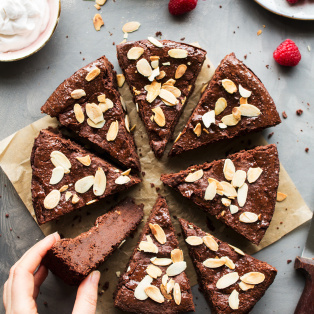 *Please adjust the amount of almond essence to the particular brand you have as they vary vastly and too much essence can render the cake unpalatable. I used VAHINE Bitter Almond Essence as that’s what I had to hand. This recipe is based on my mum’s plum cake and this recipe. Haha! Great story. Love that the plums responded to your pep talk. Also, I really want to know how you got icing sugar on the cake but not on the plums?! 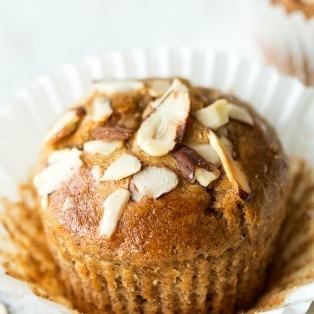 I have only a bit ground almond left but will go ahead and give this a try! What size baking tin should we use? I made the gluten-free version today with Italian prune plums and it was quite good. I really enjoyed it and my mom loved it too. 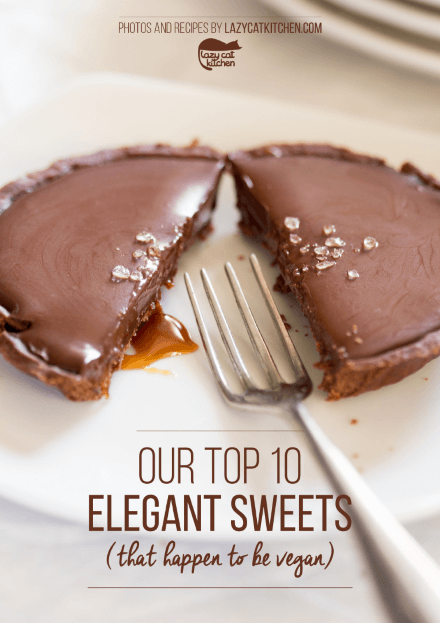 We both loved the lemon-almond flavor of the cake, and the buckwheat was very satisfying and hearty – an interesting choice for the gluten-free flour. 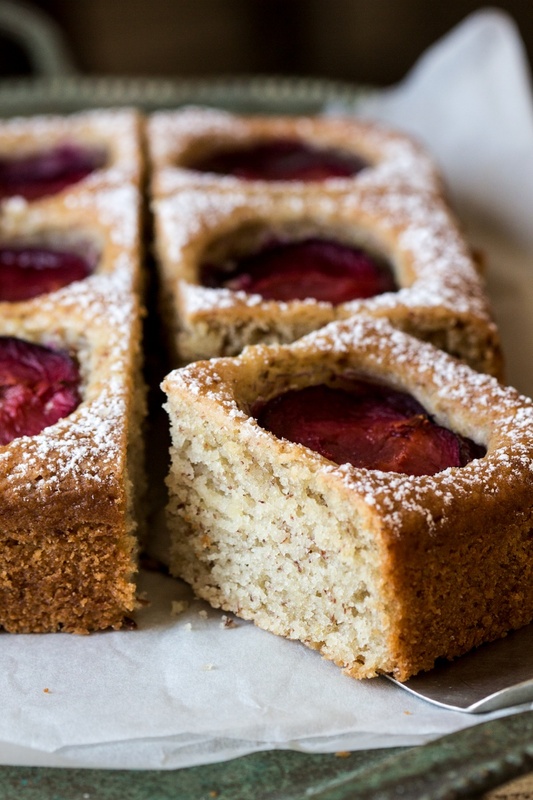 The plums were incredible in this cake. Out-of -this-world. I ate 2 big slices about 7 hours ago and I’m still not hungry. Usually when I eat cake, my blood sugar goes all out of whack and I’m shaky and famished an hour later. I feel good about this cake. I’ll make it again. I was thinking about making muffins next time and keeping them in the freezer. I bake often and tried the gluten free version and it just did not rise and was very tough so sadly it went in the bin, although I saved the plums so I can try again. I just found your website after looking for a vegan plum cake recipe, and I am so glad that I did! Here is a tip if you ensure that you have a nice moist cake, add some vegetable glycerine to the batter, My mother got this tip from a French pastry chef and always used it and it works! Hi Ania, looks amazing! 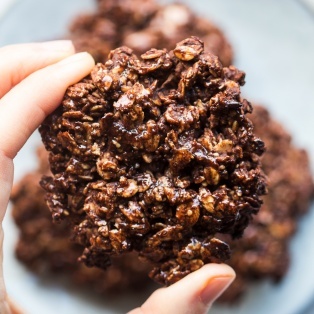 I want to try this recipe but can I use something other than almond meal? I have flax, cashews, walnuts, peanuts, coconut – would any of these ground up into meal work as a substitute? I’m going to make coconut milk from scratch for this anyway so I’m wondering if I could use some of the leftover pulp in this recipe. Can I also omit baking powder and increase baking soda and lemon juice? I don’t use baking powder. i always try to increase whole grains in my baking and often substitute it for some (not all) of the white flour. 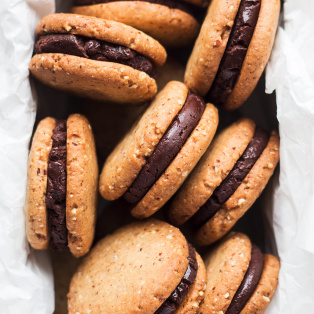 Can i do this here, using either white whole wheat flour or whole wheat pastry flour? Say a quarter or a third? 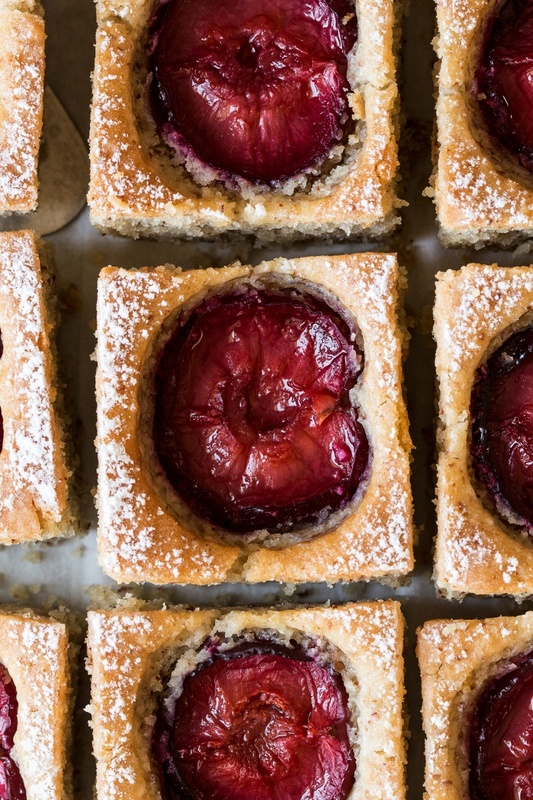 Hello, I would like to try the gluten free version of this plum cake and I was wondering if I can use coconut sugar instead of caster sugar.. thank you! I wonder how your cake looks so light if you used buckwheat flour. I’m delighted to hear that, Annette! Thank you 🙂 Merry Xmas!